In honor of everyone who is confronting cancer in their lives, I have prepared this special free deep relaxation and guided imagery experience. I had the honor of co-founding the second cancer self-help center in the world, and the first that began to train interns. It’s hard to believe these days, where EVERY self respecting hospital, medical center, and clinic has patient self-help groups, that in 1977 there were NONE. In those days patients could not utter the word “cancer” without trembling in fear, and physicians and families would often hide from people the fact that they had cancer. We discovered that patients who visualized their white cells as aggressive, even vicious, attacking agents, and the cancer cells as being weak and confused had much more favorable outcomes. The imagery here is based on that which we used at the center, where i remained as medical director for 20 years. • This Anti-Cancer imagery is a great addition to my other CDs of imagery for cancer patients. I have recently published 2 new CDs for those in chemo or radiation therapy. • Feel free to forward to anyone with any kind of cancer, with my best wishes for complete healing. 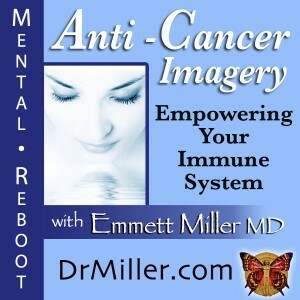 • About Dr. Miller’s Cancer Support Guided Imagery and Meditation CDs, MP3 Downloads, DVDs and Books. 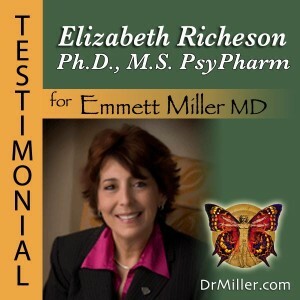 • Listen to Elizabeth L. Richeson, Ph.D., M.S. PhysPharm speaking about her own use of Dr. Miller’s Guided Imagery recordings in her profession and in her personal battle with Cancer. Let me know what you think of this guided imagery experience. What other Guided Imagery Experience do YOU want to hear? What would be most beneficial? How are YOU using guided imagery in your healing?